It is fitting that the man many consider the pioneer of marketing for college athletics also began his educational career as a pioneer. Jim Host is known throughout the country as the founder of Host Communications, a successful college sports marketing and association management company. 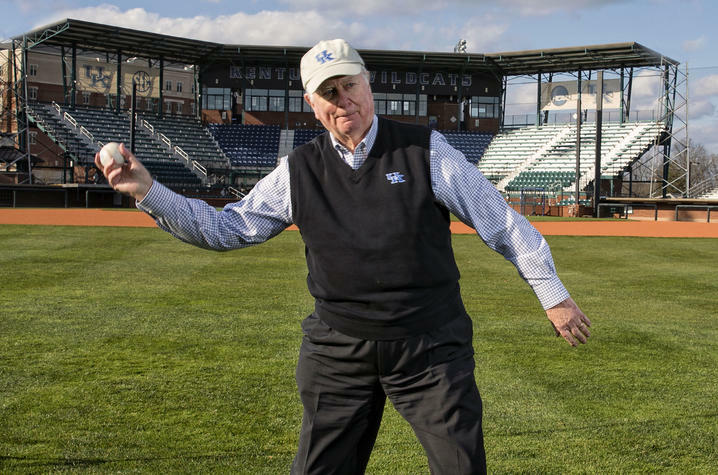 Growing up in Ashland, Kentucky, in the mid 1950s, he chose University of Kentucky when Harry Lancaster, the head baseball coach, approached him with an offer he couldn’t refuse. Host turned down an offer to play professional baseball right out of high school to become the first in his family to attend college. It was a move that would lay the foundation for a career as a trailblazer in the field of collegiate sports marketing. Before entering the marketing world, Host studied radio and television in what is now UK’s College of Communication and Information. He says he enjoyed the classes and his professors, most notably Kentucky Educational Television’s (KET) Len Press. But an opportunity to do play-by-play for UK basketball games afforded him experience the textbooks could not offer. Upon graduation, Host played professional baseball before returning to the Commonwealth to pick up where he left off on the radio — this time for the Kentucky Central Network, one of five radio networks broadcasting UK games. From there, he worked in insurance, real estate, sales and eventually politics. It wasn’t until the aftermath of an unsuccessful campaign to become lieutenant governor that the foundation for Host Communications was laid. He says he owed money and had only $107 left in the bank, so he asked to use an apartment above Ray’s Barbershop in Lexington’s Chevy Chase neighborhood as an office. “It started as Jim Host and Associates because I didn’t have any associates, but I wanted to make it sound like a big company,” Host said. Slowly but surely that began to change as he began promoting Lexington and eventually acquired the exclusive radio rights to broadcast his alma mater’s games. The network’s success paved the way for Host to move from the university level to the national playing field. “He would later add marketing, other universities and the NCAA itself to his portfolio,” Hammond said. “He was the pioneer who convinced the NCAA to have a national radio network,” said Rick Jones, a friend and former colleague. That move led to more national connections in the world of college athletics. Once the connections were made, Host’s ideas gained even more traction. “He had the creativity to create an industry that did not exist before that time,” said Tom Stultz, another friend and colleague of Jim Host. Host is also credited with helping to secure the first corporate partner of the NCAA Tournament, Gillette, in the mid 1980s. “He had a unique perspective from the personal experience of being a student-athlete as well as a business perspective,” said Jim Dinkins, chief retail sales officer for Coca-Cola North America. Host said he ran his business by emphasizing the importance of always doing the right thing. Ultimately, the combination of his business and personal perspectives transformed the way colleges and universities operated. “He’s a pioneer whose innovation and entrepreneurial spirit led to the formation of the NCAA’s corporate sponsorship program, which now is responsible for generating millions of dollars to support the student-athletes and their programs,” Smith said. It is that direct student impact that seems to mean the most to Host today. “I think the thing that I’m probably most proud of is being able to develop revenue to give kids more of an opportunity at universities to go to school and get scholarships,” Host said. The other thing he is most proud of? A long history of working with students at the universities his company represented. “I take great pride in how many students we trained and how many different universities in which we had relationships,” Host said. Ironically, an industry leader in sports marketing today, Vince Thompson, clearly remembers Host from his college job in the sports information office at Auburn University. Despite being known as a trailblazer, despite the accolades and accomplishments, despite the numerous awards adorning the walls of his office, when Host reflects on his career, he says the thing he treasures most isn’t a thing at all. It’s the people. “The memories of all the great broadcasters I’ve worked with, all the great people and coaches that I’ve met, all of the relationships that I’ve developed over the years have meant more than whatever little money I have,” Host said. It is a lesson he has successfully passed along to others. That is why, when you ask former colleagues and friends to talk about Jim Host, their descriptions go beyond his career milestones. Watch the video above to learn more about how the University of Kentucky helped pave the way for Host’s groundbreaking career.